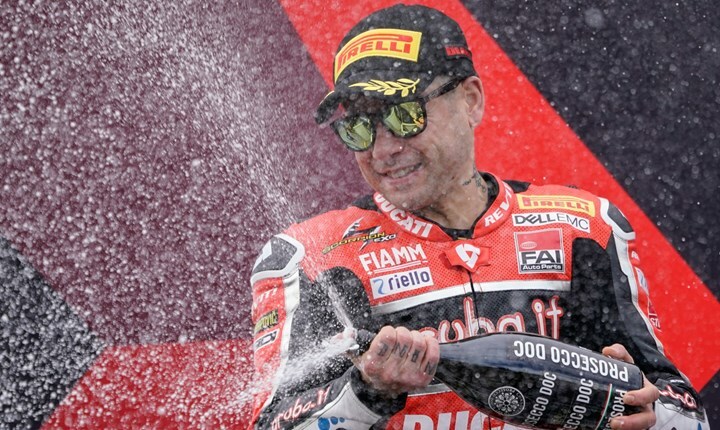 Alvaro Bautista made it nine WorldSBK wins in a row over the weekend (6-7 April) with yet another treble victory, this time at Aragon in his home country. The 34-year-old made light work of the opposition again, with a commanding 15-second win in the first race, though all eyes were on a cracking scrap for second place. Reigning champion Jonathan Rea stormed from 10th on the grid to join a six rider fight for the remaining podium positions, with the Northern Irishman eventually emerging on top while Bautista's teammate Chaz Davies scored his first podium of the year with third. Bautista then made it eight in a row with victory in the Superpole race, this time by just under six seconds while again there was another thrilling fight for second. Rea, Alex Lowes and Chaz Davies went at it hammer and tongs, with Lowes looking likely to secure second after a late error from Rea, only for Rea to claim the position back. The Spaniard then made it three from the weekend and nine in a row, with another crushing win on Sunday afternoon, while yet again the action behind him was intense. Rea emerged on top of another epic fight for second, his ninth successive runner-up spot so far this season, while Davies claimed third again after beating Leon Haslam, who had been battling with an infection in a split operation scar throughout the weekend. In the championship standings, despite his dominance, Bautista's advantage over Jonathan Rea is just 39 points, thanks to Rea's supreme consistency so far. The field head to Assen in the Netherlands in two weeks time, with rounds following at Imola, Jerez and Misano before the only UK round of the season at Donington. Donington Park hosts the only UK round of the Motul FIM Superbike World Championship on 5-7 July, with tickets available in advance from £25, while children under-13 go free all weekend. For more information click here.